Griffs as Therapy Dogs - Griffology...where every paw counts! Several have asks about the possibility of using a Griff as a THERAPY DOG. With a series of presentations here, I would like to offer the definition of a "Therapy Dog", the steps to become a "Therapy Dog Team" and the appropriateness of a GRIFF in such an environment. WHAT is a Therapy Dog? A Therapy Dog is a dog trained to provide affection and comfort to people in hospitals, retirement homes, nursing homes, hospices, schools, people with learning difficulties, and stressful situations such as disaster areas. 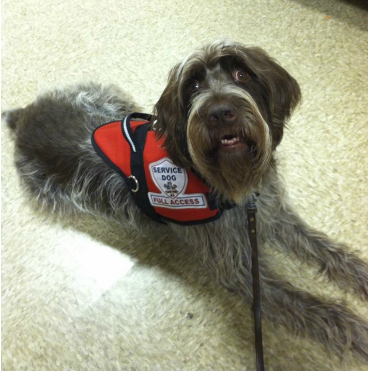 The most important characteristic of a therapy dog is its temperament. A good therapy dog must be friendly, patient, gentle, confident and very much at ease in all situations......even stressful situations. The dogs must enjoy human contact and be content to be petted and handled, sometimes clumsily and awkwardly. The Therapy Dog's primary job is to allow unfamiliar people to make physical contact with it and ENJOY the contact. Children love to hug animals and adults enjoy simply petting. Many dogs contribute to the visiting experience by performing small tricks for their audience or by playing carefully structured games. In hospice environments, therapy dogs can play a role in palliative care by reducing death anxiety. Therapy Dogs are NOT service dogs. Service dogs directly assist humans and have a legal right to accompany their owners in most areas. Institutions may invite, limit or prohibit access by therapy dogs. Many organizations provide testing and accreditation for therapy dogs. In the US, some organizations require that a dog pass the equivalent of the AKC's Canine Good Citizen test and then ADD further requirements specific to the environments in which the dogs will be working. Other organizations have their own testing requirements. HOW DO WE GET THERE? Of course, an important thing to consider is the need for Therapy Dogs in your area. Check around to see if there is an active Therapy Dog chapter in your area and good places to inquire are local hospitals and obedience trainers. A local chapter, either independent or representing a national registration agency may have all the tools you will need to train and ultimately evaluate you and your puppy for registration and/or acceptance into a local program. Many hospitals require teams to be currently registered with a national agency, such as Pet Partners, Therapy Dog International, etc.. You must provide current credentials to make visits. Some smaller market areas require only an "on site" evaluation of you and your pup. The evaluation is usually conducted by a senior member of the local program and may involve socialization with other participating dogs and simulated hospital visits. The national organizations provide registered members with a large liability insurance policy......as much as $3,000,000 in some cases. The insurance protects you and the institution from unexpected issues. Also inquire what protection you will have when joining a group or national program. PERKS: The national organizations provide your puppy with a vest, recognizing him as a Therapy Dog. The local institutions may provide YOU with a vest or jacket, clearly designating you as a team member. Therapy Dogs are often WELCOME in retail stores and restaurants. Always ask management before entering and always explain you are a THERAPY DOG team and you do not have a SERVICE DOG. Many will ask if your dog is a SERVICE DOG, simply not understanding the difference and you should be quick to denote the difference. Bear, Mandy and I enjoy eating INSIDE many of the nicer restaurants in the area and of course, the pups proudly sport their vests. Patron are very anxious to interact with the puppies, even hassling over who will sit next to them. A therapy dog has that kind of attraction when in full uniform, and a Griff just makes a more incredible experience. Some airlines are also very receptive to Therapy Dogs riding with their team partner in the cabin. Bear and I have flown to dog shows in Long Beach, NYC and Orlando on Jet Blue........with Bear in seat 1A......for FREE. In fact, we are always boarded FIRST. Again, check ahead and fully understand airline policy. ON YOUR WAY: Assuming you now have located a need for Therapy Dogs and you have located an obedience trainer or chapter TD training program, it is time to begin the fun part. If your puppy has completed an obedience program WITH YOU, you are well on your way.What must the puppy learn from training ?? Many of the commands are used in the field and in the ring, but include: WHOA~SIT~DOWN~STAY~LEAVE IT~COME~GENTLE~HEEL We do not teach SHAKE for fear the puppy might accidentally bruise or scratch the patient.With the "stay" command, you will be required to command your puppy to first "sit" and then "stay" while you walk away for ten to fifteen feet. After a prescribed amount of time, you will command your puppy to come.